With the State’s drastic changes to estate recovery, there has been a corresponding increase in the number of clients for whom an irrevocable trust becomes an attractive option for Medicaid planning. At the same time, over the course of my work with clients in 20+ years as an elder law attorney, I have seen many cases where clients had at some point in the past created an irrevocable trust, and ended up with serious problems because the trust was drafted improperly, or because they simply did not understand how the trust worked. I want to set out some of the points I use to educate my clients when we talk about irrevocable trusts. This isn’t meant to be a complete analysis of all the legal issues regarding this type of trusts, rather a set of highlights. How any of these applies to a particular case depends very much on individual circumstances. There are a number of different kinds of irrevocable trusts, set up for different reasons including not only Medicaid planning, but also to benefit disabled children or relatives, for estate tax planning, and charitable gifting. Here I am talking about Medicaid irrevocable trusts. Readers should always consult with an Elder Law Attorney for advice on their specific situation. 1. An irrevocable trust can protect assets for Medicaid eligibility purposes, but means those assets are not available for your own use if you are the one setting up the trust and funding it with your assets. When a trust is set up to protect assets for Medicaid purposes, the key feature is to structure the trust so that assets are not considered to belong to the “grantors” (the people setting up the trust and funding it with their assets) if the grantors need to apply for Medicaid. In order for this to work, the grantors cannot have access to any of the “principal” of the trust – in plain language, this means if you put $100,000 into the trust, you cannot get it back out. AND what’s more, that $100,000 cannot be used for your expenses, such as your care, your needs, vacations, your bills, any repair to your home, etc. You cannot take the money for your needs. Period. Which brings me to an important point. The concept of “protecting assets” for Medicaid purposes is a bit of a misnomer. This is because often, in order to avoid using assets to pay for nursing home care, frequently you must transfer them out of your control and possession. Which really means that you are not “protecting” them at all as far as your own needs. You are “protecting” them in the sense of passing them on to your chosen beneficiaries. That may NOT be what is best for you in terms of your own needs, and possibly may not be what you are inclined to do. When I make this point with clients, I am very strong about it. Clients should not engage in this type of Medicaid planning if they need to use the funds for their own care and expenses. On the other hand, some clients are in a position to do this type of planning. This is a very fact-specific analysis and should not be made on the basis of some “package” deal or “group” presentation that many clients fall victim to. Insist on individual advice by a qualified attorney. Because you cannot have access to the principal of a Medicaid qualifying trust, it is important to plan on having enough assets outside of the trust to meet your needs. EXAMPLE: I had a client whose family came to me for advice after he had set up and funded an irrevocable trust. He put his home into the trust, and ALL of his liquid assets. At the time he created the trust, he was already in the early stages of Dementia. Shortly after funding the trust, he needed to move from his home into assisted living. He did not have enough funds to pay for his care. His family did not understand how this trust was supposed to work, and did not understand that the assets in the trust could not be used to pay for his care. We solved the problem, but it was complicated. 2. You can opt to have access to income from a Medicaid irrevocable trust, but if you do so, it will count when you apply for Medicaid. A Medicaid Qualifying trust could allow you to get income from the assets in the trust. In other words, if that $100,000 in the trust is earning 1% interest per year, you could receive $1000 per year. But that is it. You cannot get the principal. If you set the trust up so that you can get income, then that income will be counted as your income when you apply for Medicaid. This is true even if you choose not to take the income in a given year. If you want to be able to get income from the trust, it must be set up carefully so that only the income counts, and not principal. Improperly drafted trusts will result in the entire amount being counted as an asset. 3. Transferring assets to a Medicaid Qualifying Trust creates a penalty period that will affect you for FIVE YEARS after you transfer assets to the trust. If you or a spouse needs to apply for Medicaid, you will need to disclose all assets you have transferred into this trust for the last five years. Because the transfer of assets to the trust creates a divestment, this is NOT the type of trust you want to keep putting money into without understanding the negative consequences. EXAMPLE: If you transfer $100,000 to an irrevocable trust on July 1, 2014, you will need to disclose that transfer if you apply for Medicaid any time through July 1, 2019. The penalty will be calculated based on what you gave away, For example, using today’s rates, a $100,000 divestment would cause a penalty of 410 days where you would be ineligible for Medicaid. For this reason, it is important to keep your “operating accounts” such as basic checking where your Social Security and Pension income is deposited, outside of the trust. 4. If you transfer your home or real estate into the trust, you cannot use your own money for major repairs without creating a penalty. The biggest problem I see involving individuals or couples that have already created one of these trusts, involves clients who have put their home, or other real estate, into the irrevocable trust. They have transferred their home into the trust without understanding that this means when it comes to Medicaid, they no longer own it. They are often shocked when I explain this. I blame this on a failure by whoever created the trust for them in the first place. It was not properly explained to them. This is complicated, because the tax treatment of property in the trust could be different than the Medicaid treatment. But what it boils down to, is that if you want to continue to live in a home that has been transferred to the irrevocable trust, you should be careful about detailing the financial arrangements regarding the occupancy of the home. For example, you may be able to continue to pay some costs of the home such as taxes, utilities, etc as a cost of occupancy. But if the home needs a new roof, the trust must pay for it. If you pay for it yourself (because you see this property as “your” home) you may run into a divestment penalty since you paid for a major repair on a home that was not yours. The occupancy arrangements regarding your home should be worked out at the time you set up the trust, so that everyone is on the same page and things go smoothly. This also means that if the home is sold, you do not get to keep the money, since the home belongs to the trust. The proceeds from the sale will go into the trust. 5. You can reserve the right to decide who gets the trust assets after you die, even after the trust is set up and funded. One of the nice things about a Medicaid irrevocable trust, is that even though you cannot get the assets back for yourself, you can reserve the right to decide who gets them when you die, AND you can change your mind about it. This power is called a “reserved power of appointment” and becomes useful to clients who want to have the freedom to choose who benefits from their assets. This is also one of the main things that makes an irrevocable trust BETTER than simply gifting assets to family members as part of a Medicaid planning strategy. When you gift money, it is done. You don’t get to change your mind about who you give it to. But with an irrevocable trust, you can keep this right as long as you are able to make those decisions. The only caveat to this is that for tax purposes, you cannot reserve the right to appoint yourself or your estate as the beneficiary of the assets. 6. Assets in an irrevocable trust will not be taken by the state through estate recovery. Under current law, if your assets are in an irrevocable trust, they will not be subject to estate recovery. This means that if you receive Medicaid in a nursing home, the assets you put in the trust will not be taken to pay back the benefits you received. 7. You can retain control of an irrevocable trust by selecting yourself as a trustee. While you must give up the right to use the assets you put in an irrevocable trust, you can still be in charge of managing the assets as trustee. For example, if you were the trustee of an irrevocable trust that contained your house, you would decide when if ever the house should be sold. If liquid assets are in the trust and you are the trustee, you can make decisions about investing the assets, and about whether or not anything should be distributed for the benefit of your beneficiaries (but NOT yourself or your spouse). You can also name successor trustees to manage the trust if you cannot. 8. You can retain certain tax benefits by setting your trust up correctly. Certain provisions can be put in an irrevocable trust that will allow the assets to be treated as your assets for tax purposes, which minimizes capital gains taxes when the assets are sold after you die. These provisions are designed to make the trust an “intentionally defective grantor trust” for tax purposes. This can be particularly important if you are transferring appreciated assets or real estate into the trust. Retaining the right to income is one of these provisions. Reserving the right to change beneficiaries is another one of these provisions. There are others. Talk to your lawyer about whether it makes sense to include these provisions in your trust. 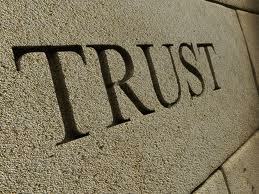 In fact, my position is that for most of the people I see, an irrevocable trust is too risky. This type of trust is probably not right for you if you have modest assets and are in declining health. Most of my clients are in this position already. If you want to consider this type of trust, it is something you may want to thing about when you are just entering your retirement age and can afford to set things aside while still healthy. It can also be appropriate for couples who have a secure retirement nest egg or who have long term care insurance. 10. A problem trust may be repairable, even when it is irrevocable. If you are a person who has an irrevocable trust and has learned that there is a problem, either because you did not understand how it works or because it was improperly drafted and now the Medicaid agency says it is available to you, it may be possible to fix things. I have represented clients in getting the problems with their trusts corrected. Sometimes it involves court involvement. Sometimes it can be done outside of court. So if you have a problem with your irrevocable trust, do not assume it is a lost cause. Talk to a lawyer to see if it can be fixed. A fiduciary is not individually liable on a contract properly entered into in his or her fiduciary capacity in the course of the administration of the estate unless he or she fails to reveal his or her fiduciary capacity and the identity of the estate in the contract. That’s the key to this rule. Executors, trustees beware: Disclose your fiduciary status or you can be held personally liable! If you have questions regarding a probate estate administration matter in New Jersey, please contact Fredrick P. Niemann, Esq. toll-free at 855-376-5291 or email him at fniemann@hnlawfirm.com.